Lakisha Johnson and LaQuisha Rucker are twin sisters from Memphis, TN who are God rooted and family oriented. They’re both wives and mothers who each share different talents. Lakisha preaches God’s word, LaQuisha sings. Yet their twin bond connects them in a way that only twins understand. Lakisha has written nine books and blogs daily and this is LaQuisha’s first published work. And writing this book, together, was an amazing experience. It is their prayer that readers will enjoy it as much as they’ve enjoyed writing it. They don’t know what God has in store for them as authors but they’re going to enjoy the ride and find out as they are already working on their next book. 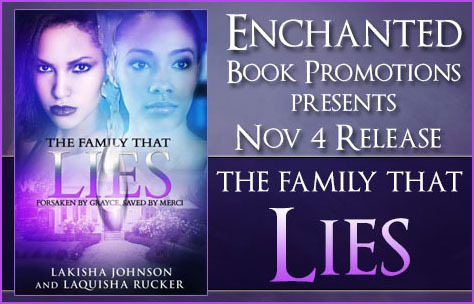 Giveaway for 2 eBook copies of The Family That Lies.